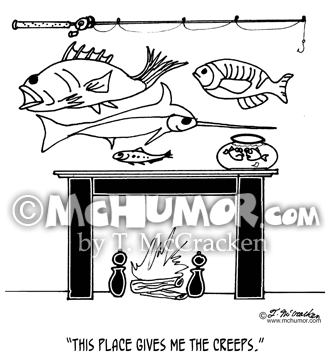 Fishing Cartoon 3386: A fish in a bowl on a mantel under lot's of stuffed fishing trophies saying, "This place gives me the creeps." 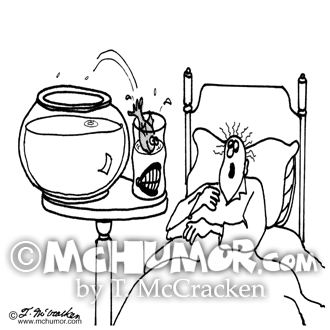 Fish Cartoon 3388: A gold fish jumps from a bowl into a glass with dentures in it. 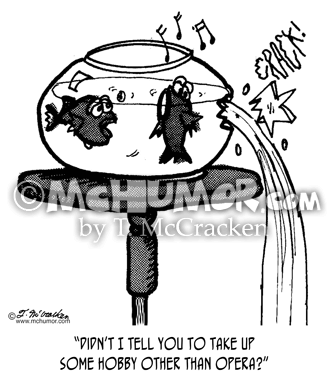 Opera Cartoon 2091: A fish saying to another whose singing has shattered the fish bowl glass, "Didn't I tell you to take up some hobby other than opera?" 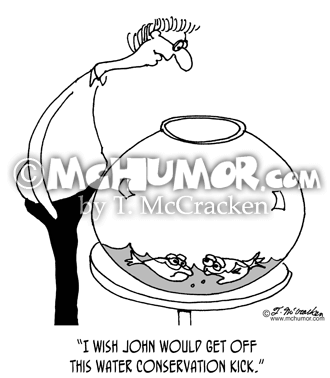 Fish Cartoon 6457: A fish in a half empty aquarium saying to another, "I wish John would get off this water conservation kick." 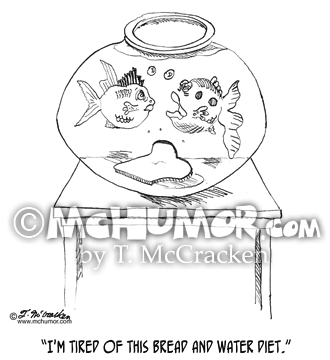 Fish Cartoon 0983: A fish in bowl with toast says, “I'm tired of this bread and water diet." 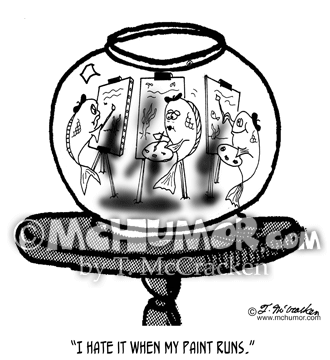 Painting Cartoon 5818: A fish in an aquarium painting says, "I hate it when my paint runs." 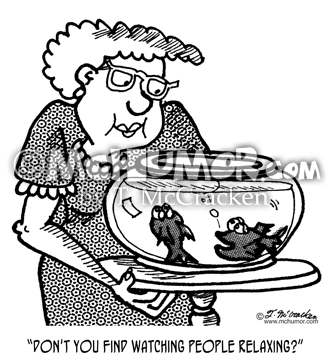 Fish Cartoon 2099: A fish in a bowl saying to another about a woman looking at them, "Don't you find watching people relaxing?" 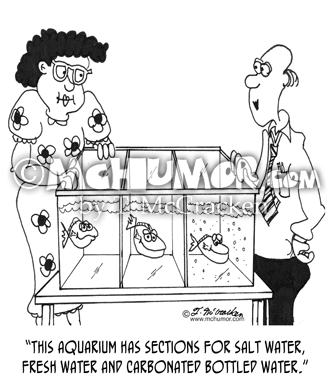 Fish Cartoon 4841: A man showing off his fish aquarium with three compartments says, "This aquarium has sections for salt water, fresh water and carbonated bottled water." 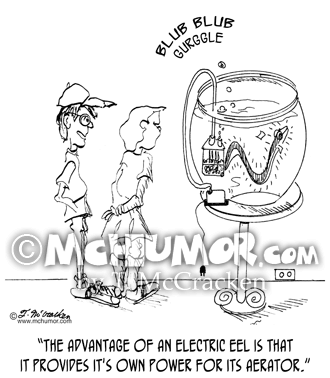 Fish Cartoon 1088: A boy with a fish bowl says, "The advantage of an electric eel is that it provides it's own power for its aerator." 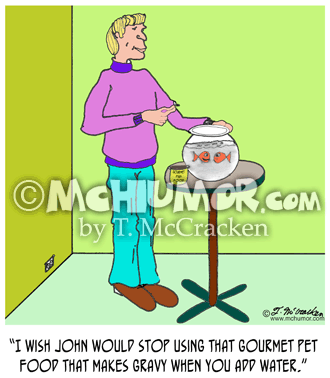 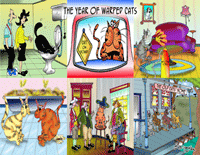 Fish Cartoon 1237: A fish in a bowl with dark water says to another, "I wish John would stop using that gourmet pet food that makes gravy when you add water."